So what does it mean when you have this badge? This place will have Wi-Fi, a designated workspace, an iron and hair dryer and a strict policy when it comes to cancellations — hosts can’t cancel less than seven days before your stay. When it comes to host tools, there is a new Host Assist feature for easy key management. The company has been working with connected locks companies and key exchange companies (August, Danalock, Igloohome, Kevo, Keycafe, Lockstate, Miwa, Nest and Yale) to let you easily grant access to your apartment to your guests. Airbnb will send virtual keys to guests or let you hide a key. In particular, Keycafe has key lockboxes to “hide” physical keys. Keycafe is launching in Paris today. Host Assist is available today. Finally, the company is adding smart pricing in order to let you know how you should price your listing — once you turn it on, it will adjust the price of your listing automatically within a range set by the host. Airbnb hosts cheered in the audience when the company announced the news. The company monitors demands and offers in order to provide a better price. The idea is that hosts get more money by lowering prices to improve filling rates and raising prices when it makes sense. Smart pricing is going to be a progressive rollout. It is available for web and mobile hosts starting today for Airbnb Open attendees. Other hosts will get it later. There is a new dashboard for hosts to get a better view of your pending requests, upcoming guests, reviews and more. The community section has been revamped as well. The new features are all about making it easier for new hosts to get advice from super hosts. Overall, these new tools are nice addition and make the hosting experience better for existing and new hosts. 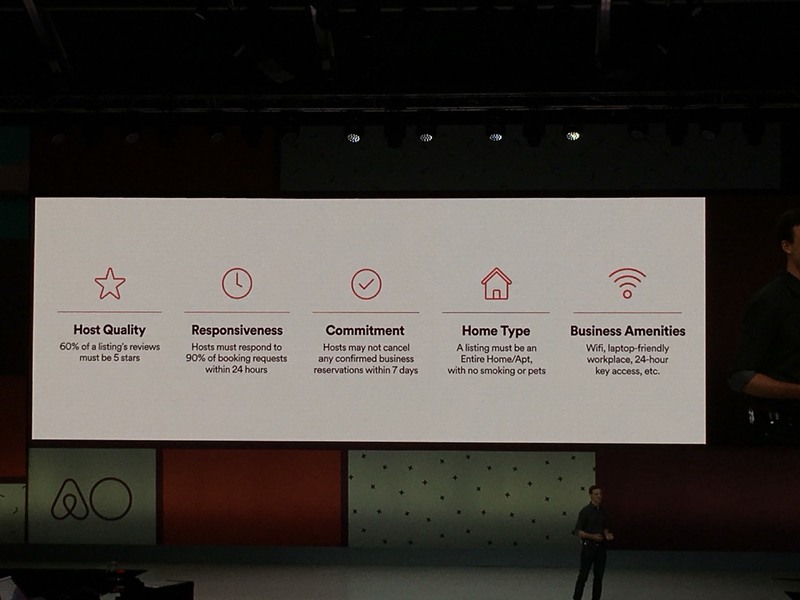 All of these new features should help the company when it comes to getting more hosts on board, getting more guests in existing listings and improving the company’s bottom line. Ever since Airbnb was created, 60 million people stayed in Airbnb listings. This year alone, 25 million people stayed in an Airbnb place. Cuba and Asia are two important growth markets for the company. VP of Product Joe Zadeh announced some changes in the sign-up flow. New users will first be greeted by a message saying that you’re staying in a home, not a hotel. Then you’ll have to upload a profile picture before sending your first message. You’ll also have to accept house rules. All of this was (of course) well received by the audience at Airbnb Open. The new sign-up flow was released last week.